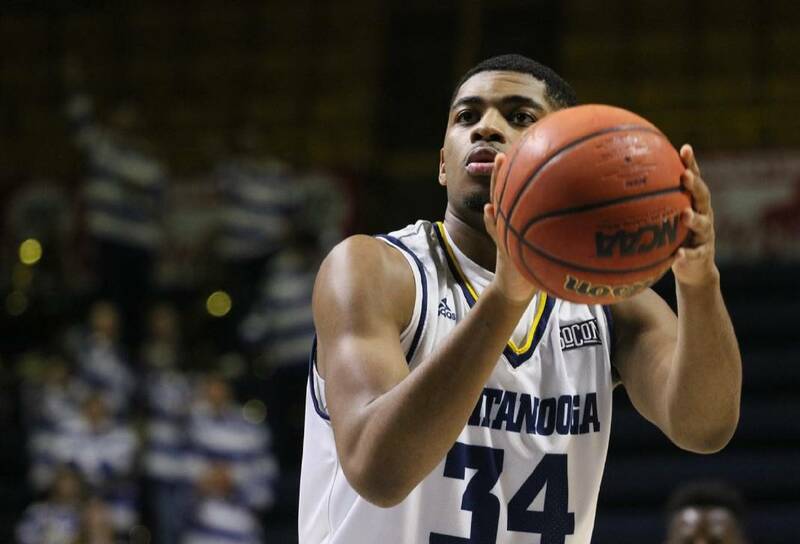 Kevin Easley, who was recently named SoCon men's basketball freshman of the year for the 2018-19 season, told UTC coach Lamont Paris on Wednesday that he will be transferring out. Updated with more information at 9:30 p.m. on March 20, 2019. Kevin Easley has decided to transfer from the University of Tennessee at Chattanooga, just a couple of weeks after being named the Southern Conference freshman of the year for men's basketball. UTC coach Lamont Paris admitted he was surprised by the decision, which he learned of during Wednesday's meetings with individual players that follow each season. "It caught me off guard," Paris said. "Kev came in here and said he had met with his family and they had decided it made more sense to be closer to home for him. He thanked us for what we did for him and the opportunity we gave him and that we did a good job with him." Easley, who is from Indianapolis, led the Mocs this season in scoring (14.2 points per game) and rebounding (6.7), shooting nearly 40 percent from 3-point range. ESPN made the 6-foot-6, 232-pound forward a four-star prospect during his stellar career at Lawrence North High School. Paris said Easley, who had more than 20 scholarship offers from Division I programs before signing with the Mocs, did not say where he plans to transfer. Paris added he did not believe Easley was unhappy with UTC coaches, the university or his teammates. "Kevin came in here and we met, and he was very respectful," said Paris, who led the Mocs to a 12-20 record in 2018-19, his second season with the program. "There was no animosity, and I don't take it personally." Paris, an assistant at Wisconsin for seven seasons before coming to Chattanooga, acknowledged the prevalence of transfers in modern college sports, though. "The biggest thing is this is an atmosphere that's been created," he said. "Unfortunately, we as coaches and administrators have contributed to it. You can't be all distraught over it. "You work hard to recruit highly talented players, and in this environment, as it stands currently, oftentimes this is what happens. It is not a positive environment, to me, and the NCAA has made it easier for athletes to transfer. There are reasons to transfer, but it's tearing at the fabric of what we have in an institution of this level." Paris said the Mocs are equipped to handle the loss on the court, and he hopes someone will seize the opportunity. "It will be a great opportunity for someone — guys we have in the program, and we're looking for more guys to add to the mix to what we have going," he said. "We've got guys like Rod Johnson, who was hurt this year, Keigan Kerby was effective for us, as was Justin Brown when he got minutes at that position. "So we'll see. Guys will have to step up."